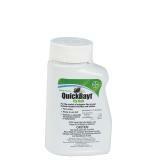 Ready to use as a scatter bait, but can also be used in bait stations or as a paint-on. For indoor or outdoor use. Controls nuisance flies around livestock and production facilities, poultry coops, feed lots and horse stables. Starts killing flies in as little as 60 seconds. Scatter in areas where house fly numbers are excessive or where house fly breeding occurs. Apply at a rate of 1.5 oz (3 tbsp)/250 sq ft.
Place QuickBayt in bait stations out of animal access at least 4 ft above the ground, in a motionless site where flies rest. 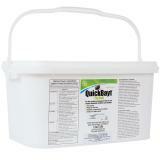 As a paint-on, mix 3 lb QuickBayt with 1 qt water and paint on surfaces where housefly numbers are excessive. Re-apply every 7 days as needed. Hazardous to humans and domestic animals. Harmful if swallowed, absorbed through skin, or inhaled. Avoid contact with eyes, skin or clothing. Wash thoroughly with soap and water after handling and before eating, drinking or using tobacco. Highly toxic to aquatic invertebrates. Do not apply to water. 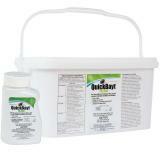 Highly toxic to bees exposed to direct treatment or residue on blooming crops or weeds. This chemical has properties and characteristics associated with chemicals detected in groundwater. The use of this chemical in areas where soils are permeable, particularly where the water table is shallow, may result in groundwater contamination. Do not place bait in areas accessible to food producing animals, children and pets. Do not allow contact with food or water. Use environmental controls, such as proper light management. Do not apply directly to milking equipment. Do not apply inside food processing plants or restaurants.